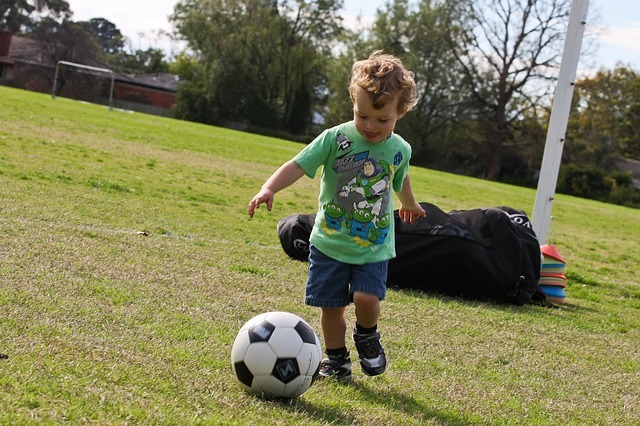 One of the most common questions that gets asked is “how can I improve my skills for football / soccer”. Since a large part of your success in the game is determined by your level of skill it’s an understandably important question to ask. But how do you know where to start and what you should work on? How can you be sure that you’re prioritising the most important things? Which skills are going to transform your game the most? Think you’ve reached a plateau with your skills? Maybe you’re wondering if you’re too old to learn anything new? 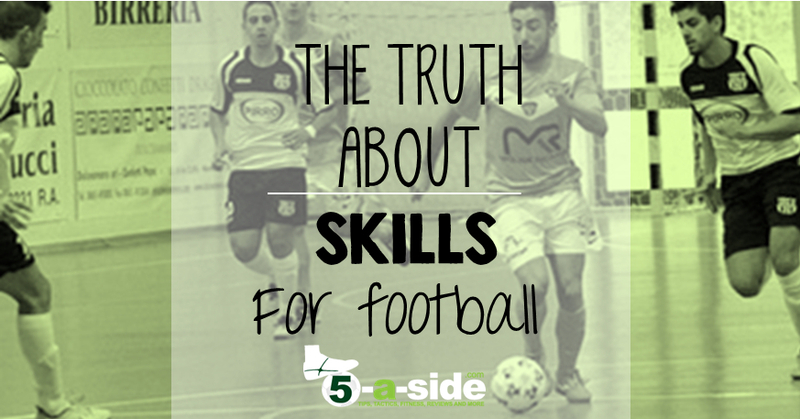 In this post, we’re going to cover the truth about skills for football. Let’s cut through all the confusion and misunderstandings to focus in on some key truths that will lead to actual improvements in your game. It’s such an incredibly basic yet important principle. But it’s one that seems to be ignored by the vast majority of the football population. We seem to work on the things that we like, and ignore the things we don’t. We’d rather perfect our right-foot shooting and blissfully ignore the fact that we couldn’t hit a barn-door with our left foot. Or we’d rather learn dribbling skills that get us into goal scoring opportunities, but neglect to improve our useless finishing ability. Think about other sports: you just wouldn’t get away with it. It’s like a tennis player having a great forehand but no backhand. Or a golfer being able to drive the ball onto the green like Happy Gilmore but then taking 10 putts to get it in the hole each time. As footballers, we often hide our shortcomings within the framework of the team – by shying away from the things we can’t do; hoping our teammates will take care of it. But if you want to improve your skills and become a noticeably better player, you have to tackle these weaknesses head-on. It will give you more possibilities, more confidence and more enjoyment as you build-out your all-round ability. Sean Garnier, world freestyle champion, mentioned this very point when he talked about ‘developing your all-round game’ in his 6 tips for Futsal. Most of us will know which area of our game needs the most work – we’ll be reminded of it each time we play. If not, ask your teammates – I expect they’ll be more than happy to tell you! Have you played with somebody who is trying to do trick after trick, as if they’ve suddenly discovered the ‘skill button’ on FIFA Soccer, yet they can’t do basic things like play a simple pass? Frustrating doesn’t even begin to describe the experience. Even if they’re occasionally nailing some quite impressive moves, it’s all quickly undermined by their inability to do the game’s basic tasks. 5-a-side is a game heavily dependent on hard work, playing smart and doing the basics well. There most certainly is a place for skills and freedom of expression, but you have to earn the right to try those things by being able to do the basics for your team. So, tantalizing as that YouTube video teaching you how to do a triple-rainbow-flick-stepover-Rabona might be, ask yourself if you can do the simple things first. Time spent building the foundations to your game is going to be a lot better than trying to mask your shabby all-round technique with some sparkle and frills. No matter how much glitter you throw on a turd, it’s still going to stink. Be able to play a simple, accurate pass along the ground to a teammate. Be able to receive a pass under pressure, controlling it with confidence. You should be able to consistently do this so that it doesn’t get stuck under your feet and doesn’t go bouncing off for miles either. Be able to strike the ball with power and, most of all, accuracy using the laces of your boot. Be able to run with ball under control at a minimum of 60% of you top sprinting speed. Be able to run with the ball at your feet in a zig-zag pattern as if dribbling in and out of a straight line of cones. To be able to do at a good speed, still having the ball under control. Manipulate the ball with the sole of your foot. We’ve got this covered for you in our essential sole-skills for 5-a-side. If you honestly can’t say you can do the above comfortably, don’t waste your time on anything more complex. Messi is a great example of what can be done with basic skills done wonderfully well. If you watch highlights of him (YouTube) you won’t see him trying too many party-pieces. Instead, he just causes absolute devastation using relatively basic dribbling techniques, feints of direction, and pinpoint finishing – which he has honed to absolute perfection. It’s inevitable that you’ll want to learn a ‘move’ or two (probably even before you’ve heeded the lesson above about mastering the basics). Just remember, it’s not about showboating. It’s about having one or two weapons in your arsenal that you have down to an absolute tee. Players do come along with complicated skills from time to time, but the majority of top players just master one or two simple skills and hone them down until they can flawlessly execute them. I could give you lots of examples of this, but take one: Michael Laudrup, European player of the year and one of the greatest playmakers the game has ever seen. If you watch his highlight reel, you’ll see one particular skill over and over again: the two-touch dribble. It was largely this (and a superb eye for a pass) that wreaked havoc against opponents. Check out the article we did covering the Laudrup two-touch dribble skill if you want to add this basic but brilliant move to your game. We pick up a lot of skills as kids, that’s true, but that’s not where the learning needs to end. There’s almost an attitude that adults don’t work on improving their skills; they just concentrate on playing the game instead. Improving skills isn’t just for kids. That’s a pity, and again it’s not what you see in other sports. If you needed to improve your tee-shots in golf you’d think nothing of going down to the driving range. But for some reason if you’re awful at shooting for football then as an adult it doesn’t seem that anybody thinks to take a couple of footballs and head down to the park. That’s a pity. Just look at the number of adults taking tennis lessons, learning to swim or working on their game down at the golf-range and you’ll see the quest for sporting improvement undeterred by age. We have a great capacity to learn at any age, it’s just a matter of whether we choose to do so. The bottom line is, if you don’t work at something you’ll never get better at it. 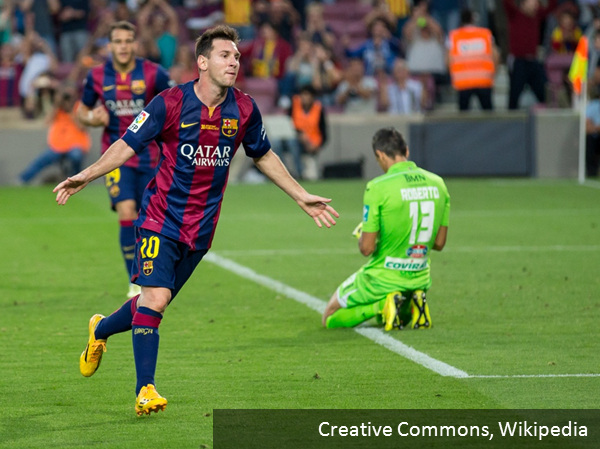 Stop being frustrated about your footballing weaknesses; go and do something about them. 99% of the YouTube videos you see where people are illustrating magical skills will be shown using a ‘patsy’. By that, I mean the guy who is there doing a terrible acting job as a defender. He’s had the move practiced on him so often that by the 100th take he’s perfected the art of doing a ridiculous, unconvincing lunge as the star of the video waltzes past him in heroic fashion. You might as well use a traffic cone. It’s totally unrealistic; the average 5-a-side defender will be ready to stick it to you at the first sign of you attempting a triple-stepover. Whilst it’s often only possible to start learning a skill by practicing it on your own, don’t be naiive enough to think that you can perfect it by repeating it over and over in your back garden. All you are developing there is technique; the skill is knowing how and when to use it in the pressurised environment of a game. Doing it in a game is a lot different to doing it in your back garden. There’s a guy I know who I always see before a game working on his shooting from distance. He does it at a casual pace, leisurely run-up onto the ball, nice and relaxed. In the warm-up he hits the target 80% of the time. In a game, it’s a different story because he’s shooting under pressure, on the run, screwing 90% of shots (and that’s being kind) to the left of the goal. He badly needs to simulate a more effective practice that more closely mirrors his game situation. Don’t fall for the same trap. Practice your skills as realistically as you possibly can. Often that means getting as much game time as you can: there’s nothing that can quite capture the realism of a game like the game its self. 6. Ball-skills aren’t the only things that make you a better player. Practicing skills might seem like the obvious way to get better and a lot of times it is. In fact, sometimes the gains you most need are the often neglected things such as your mindset, your diet, your fitness and your tactical knowledge. Getting fit for 5-a-side – start by working out how fit you need to be. Tactical knowledge: e.g. knowing how to defend properly – see our ultimate guide to 5-a-side defending. Tip: playing on the half-turn – a simple adjustment that could make a big difference to your vision and technique. Focussing on your pre-match meal, and your post-game recovery. Sometimes a little investment in one of the non-skill areas can make all the difference in your game. A small investment in these can often give a lot more benefit than lots of investment in learning more tricks. Don’t worry, we’ve got your back. If you’re still struggling with aspects of your game: let us know and we’ll help you get the resources you need to improve. Just leave a comment below. Maybe you’ve got a tip you can share with everyone else? Again, let us know in the comments below. Super Article, very well written. Should be read once a month by all youngsters. 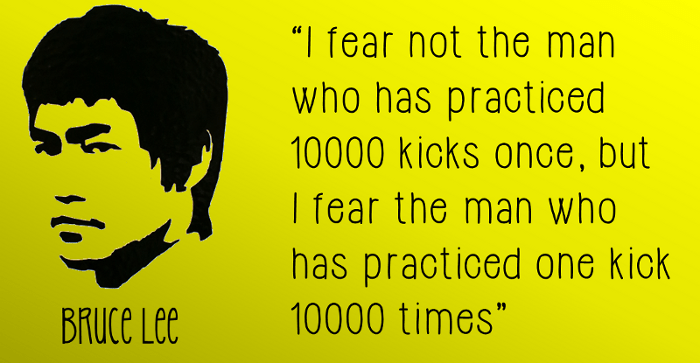 Specially like the Bruce Lee’s quote. Maybe add a point about fitness – specially agility. Thank you. Hi Ratnesh, thanks for the nice words! This should be mandatory reading! There are far too many players doing ineffective things on the pitch, just because they think it looks cool. Drives me mad. Master the basics and add a few solid skills!